This thing is a high detailed model of a vehicle you don't see every day. Being interested in fascinating vehicles like this kind, I tried to push it as far as I could with the modeling and texturing. Based on the real thing used by the IDF (Israel Defence Force) using their heavier armor on the front blade cylinders. I had to add a winch to it, because no bulldozer is complete without one of those. With this guy in your scene you can be sure your render will grab some attention. The original Gimp xcf files are included with the model. This will make it so much easier for you to make your own edits to the textures. All elements are kept on a separate layer, so you can change, for example, the yellow base color or the scratches or the dirt without affecting anything else. The materials are set up for LuxRender but since almost all objects use textures you can easily change the materials to fit your render engine. Please see the documentation on how the materials are set up. Detailed model of a very interesting vehicle. Static mesh. Contains no bones, animation or shape keys. Contains 152 objects in total, 86 of them are track pieces. Most of the parts have subsurf modifier level 1. Track links and the small wheels do not use modifiers to be able to use instancing. Includes the GIMP .xcf files with all layers to allow easy editing of the textures. Vehicle contains several objects. Texture resolution varies from 4096px down to 512px depending on how big the object is. Most objects use diffuse, roughness, bump and mix texture maps. Textures exported from GIMP with 95% jpg quality. Interior is simple untextured geometry. Layer 1 contains most parts of the bulldozer body. Layer 2 contains the interior of the driver's cabin and layer 3 contains the track link pieces. The blend file has 1 group, containing the bulldozer and its parent but not the room and ground plane. To append only the bulldozer to another file simply append the bulldozer group to the new blend file. The headlights and tail lights have the emission material ready but it's not assigned to any faces. Simply enter edit mode and assign the material to the bulb faces or exterior faces of the glass to get emission. All parts are parented to the bulldozer empty arrow to allow easy moving and rotating. Obviously the materials will need to be redone. However almost all materials are textured so you should be able to set this up easily by mixing a glossy with a metal material using the mix amount texture. Materials which are not textured include: the interior (basic sandy color), window glass for windows and lights (slight cyan color for bulletproof glass) and the inside of the lights (aluminum metal preset). The glass in the windows and lights are modeled with thickness. If your render engine do not require this, simply delete the faces facing inwards. 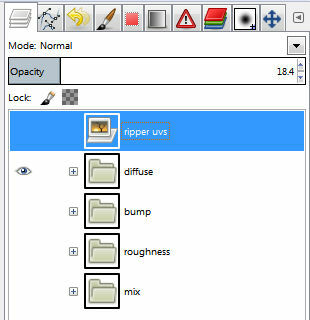 The GIMP xcf files contains layer groups for easy editing and exporting of the textures. The layer groups are named according to their texture type. For example, ripper.xcf contains layer groups diffuse, bump, roughness and mix. To export the diffuse texture, simply hide all the other groups and export (File->Export as...) from GIMP as 'ripper diffuse.jpg'. The bump texture is exported as 'ripper bump.jpg'. All other layer groups follow the same method and all GIMP xcf files use the same layer organization and exporting file name: [GIMP file name] + [layer group name] + [jpg] Several layers are copies of the diffuse version of that layer and slightly edited afterwards. Example 1, the diffuse dirt layer: That layer is also used in the roughness group. The layer is duplicated (Layer->Duplicate Layer) and moved to the roughness layer group. It is then inverted (Colors->Invert) making the dark dirt brighter to get a higher roughness value (brighter = higher). Layer mode is then changed to Lighten only. Example 2, diffuse metal layer: That layer is used in the mix group as well. The layer is duplicated and moved to the mix group above the mix 1 layer. The mix material in Blender is set up to use black as the paint and white as metal. So the duplicated layer is changed to grey scale (Color->Desaturate) and contrast is increased (Colors->Brightness-Contrast) to get desired mixing amount.